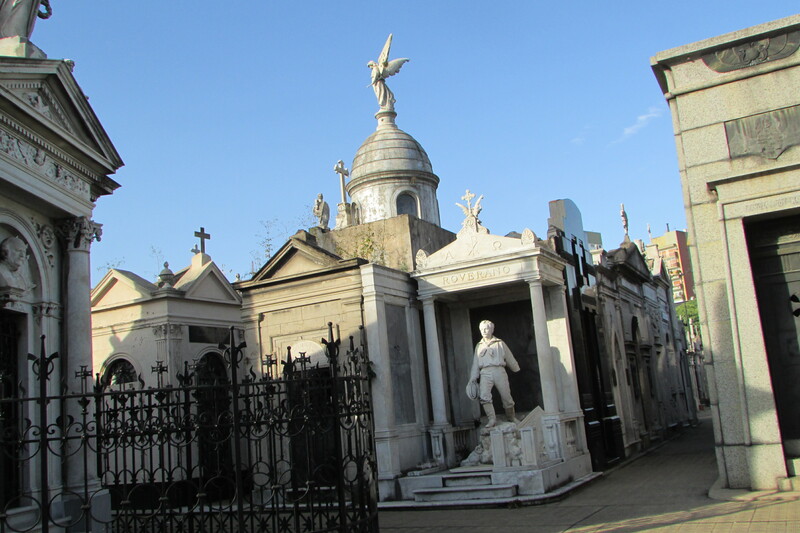 Went to La Recoleta. This is mainly a large cemetery, which is not a place I would usually visit but it featured in all the guide books and was recommended by our taxi driver. We walked there from the hotel. Passed a few people sleeping in the street, whole families in some cases, which is never a comfortable experience. The only other place that I have passed homeless children is Mumbai. Found La Recoleta, in the middle of a park with market stalls. Was glad the family weren’t with me to complain about me liking spooky places and not being ‘normal’. I thought of you – you would’ve have spent hours taking photographs at strange angles with clever close-ups. I just snapped a few pictures, none of which really captured the atmosphere. The cemetery is huge, like a small village of monuments and booths. Some had steps leading down, littered with soiled bags, empty bottles, coated in dust and cobwebs. Some had coffins stacked in view of the doorway covered in white lace cloths. 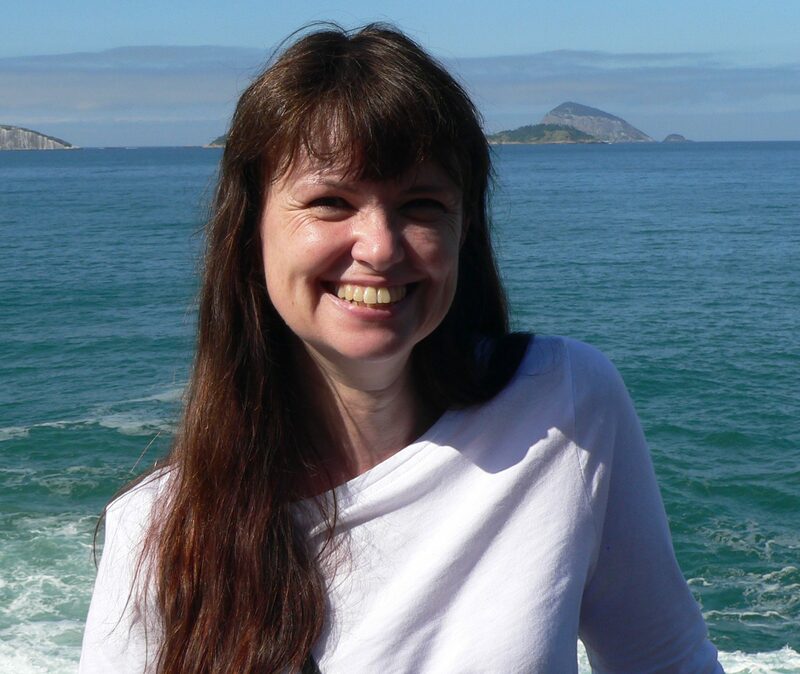 Some coffins were crumbling, threatening to spill their contents, others were pristine, polished oak with shiny fixtures. 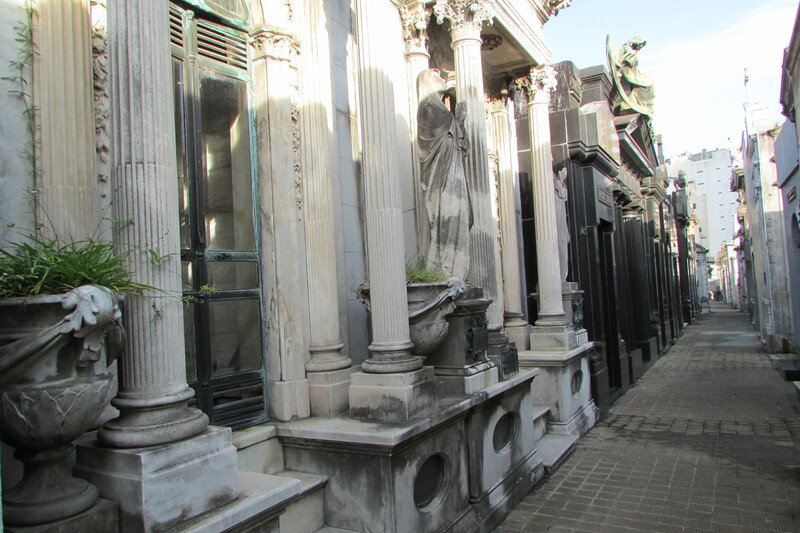 The booths were white marble, grey granite, weathered stone and black steel gates. There were lots of statues and angels and domes. A little like miniature cathedrals, with the dead being worshipped rather than God. It was a little incongruous, after passing families of homeless people. I am a tourist here, I don’t know what help is available, but at a glance it looked as if the dead have better shelter than the poor. 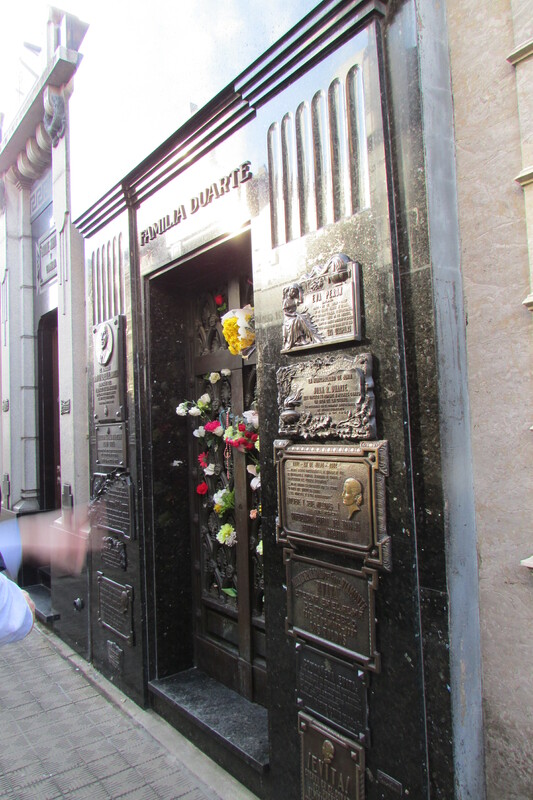 We saw the tomb where Evita is buried, and several other dignitaries, then we left. Went to La Biela, a traditional coffee house just outside the cemetery, opposite a giant ancient gum tree. 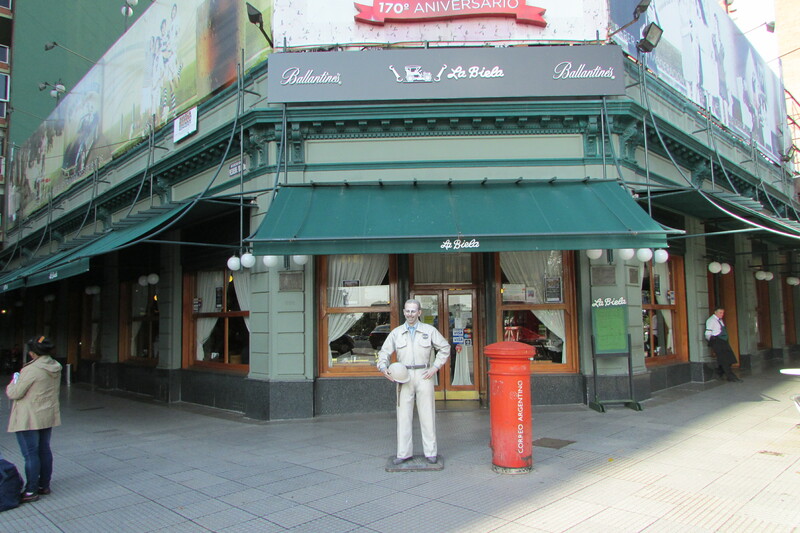 It had a motor racing theme due to being a favourite spot in the 1950’s for drivers and fans. There was memorabilia on the walls and spanners carved into the chair backs. 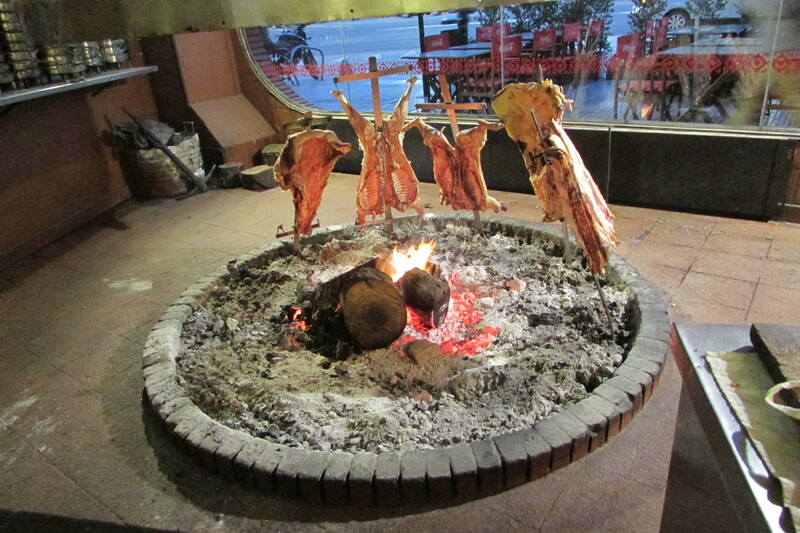 It had a lovely traditional Argentinian feel, we could’ve stayed there for hours. 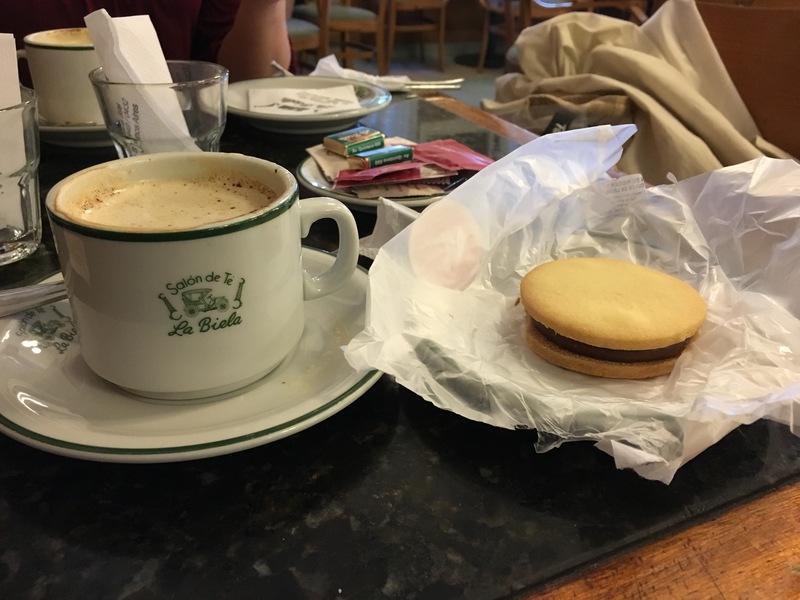 We drank coffee sprinkled with cinnamon, which tasted almost of oregano and ate ‘alfajores’, which were shortbread biscuits filled with dolce leche. The cafe was empty when we arrived at 9:30 and was full by 10am – lots of well maintained elderly Argentinians and young tourists. You would have liked it there. Ate a very late lunch in a parilla (name for a steak restaurant.) Walked from hotel heading south, along narrow streets littered with blankets reserving sites for the homeless, dog mess and broken pavements. The houses on either side were a muddle of faded villas with gargoyles and balconies and modern apartment blocks. We passed a burnt out theatre, a derelict mansion and tiny newsagents. It felt real, interesting and full of life. 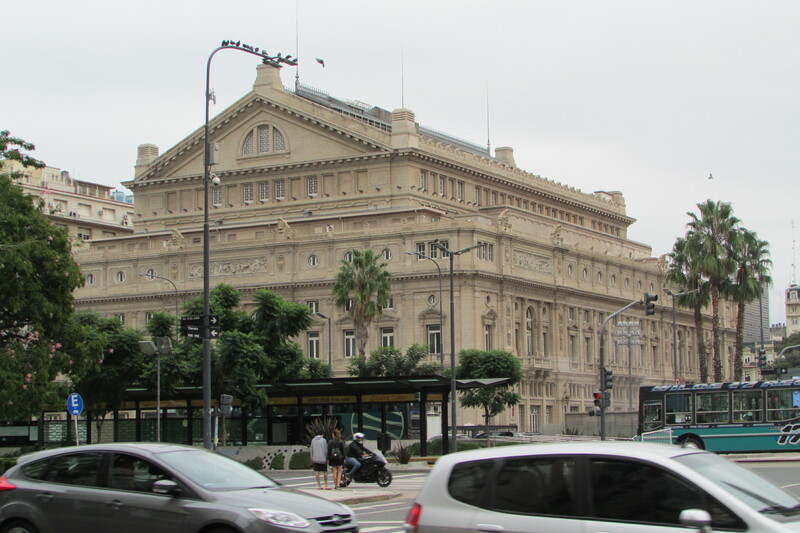 Buenos Aires is growing on me – perhaps you need more than a day here before you notice it properly. Arrived at Chiquilin in Calle Sarmento. Peered in window and it looked clean, so went in and sat in a corner table, under oil paintings and bottles of wine on shelves below the low ceiling. Ate more steak than the whole family would normally eat at home. 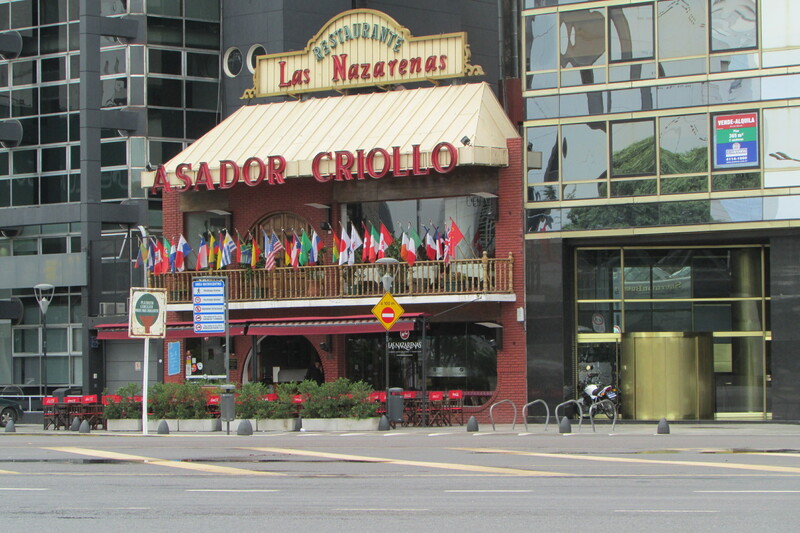 All the restaurants here have an abundance of waiters dressed in black and white, most of whom seem to either speak English or understand my very bad Spanish. Walked back to hotel. Exhausted but pleased with the day. 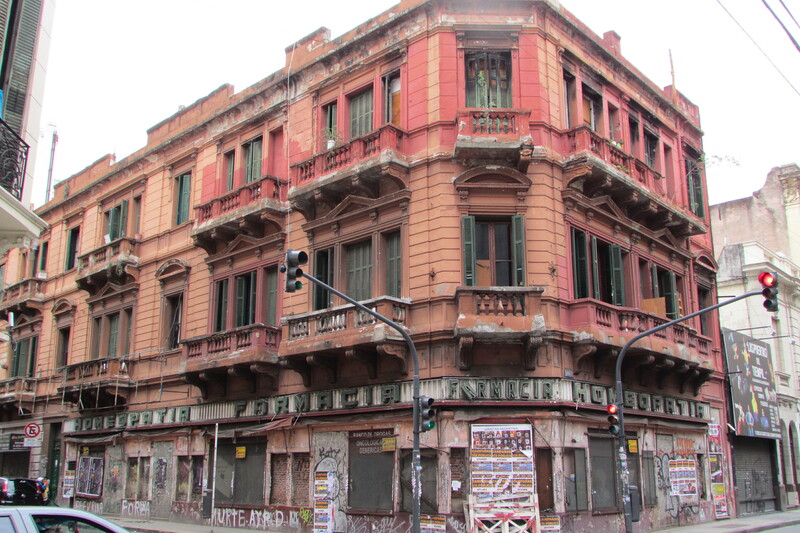 Tomorrow we might go to Uruguay – I’ll let you know what it’s like. Probably not the best place to post letters. 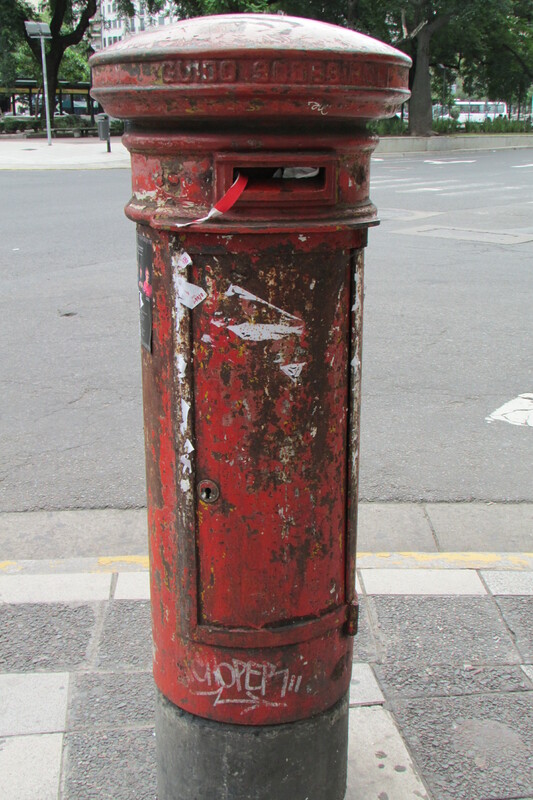 The city seemed full of derelict post boxes! 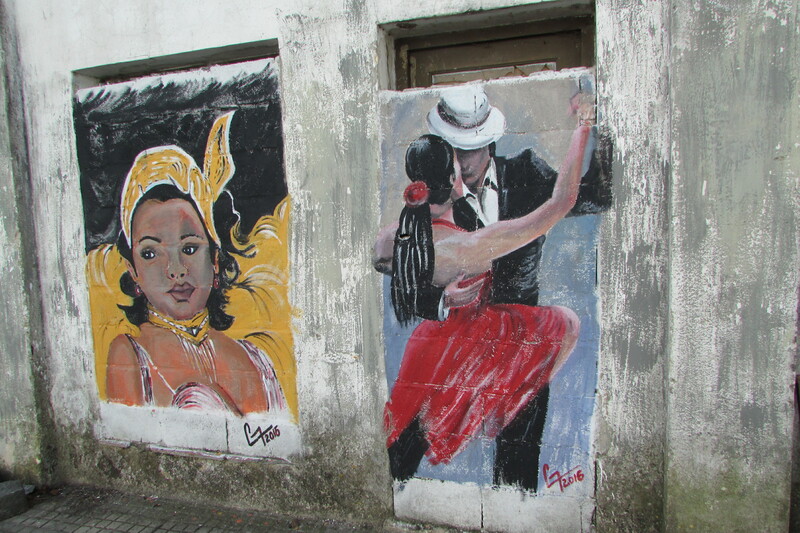 Tango dancing in the street. Another letter packed with interesting info. Even the cemetry sounded amazing!